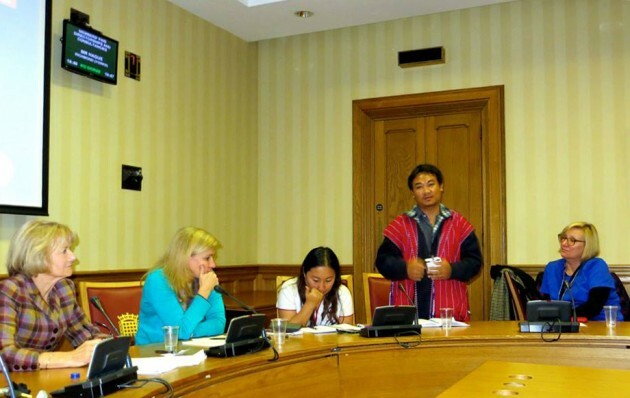 A delegation, advocating on behalf of refugees and displaced people from Burma took their cause to Britian’s Parliament in an attempt to highlight the affects of funding cuts on services to people along the Thai Burma. “As refugees, we are under tremendous pressure in the camps. There have been many reductions in services including cuts to healthcare, education, shelter, and food. We feel we are being forced to choose between being hungry in the camps or being forced to return and abused in Burma. We desperately want a better choice”, said Naw Ta Mla Saw, Joint Secretary 1 of the Karen Women Organisation. The Karen Women Organisation’s is a community-based organisation with over 49,000 members that provides its communities with education, health and social welfare. The KWO provides assistance for refugees and IDPs along the border areas. In its media statement the delegation said it planned to meet with “the Department for International Development Minister Desmond Swayne MP, officials from the Foreign and Commonwealth Office, Parliamentarians, NGOs, the Burmese community and members of the UK media. Other members of the lobbying delegation included Ms Sally Thompson, executive director of The Border Consortium (TBC) and Luiz Kaypoe from the Karenni Refugee Committee (KnRC). The delegation pointed out in its media statement that “it is important that refugees are not forgotten.” The delegation stated that the Burma’s peace process is still fragile and that despite ceasefires between the government and the ethnic armed groups conflict is still happening in parts of the country. “At the moment, shifting donor focus away from the border is perceived by refugees as a form of coercion to return prematurely,” the delegation said in its media release. A member of the delegation, Luiz Kaypoe, Secretary of the Karenni Refugee Committee said in the media statement. “Our ethnic people want peace, but the Burmese government use peace to twist and kill our people. Sadly, the international community focuses only on the situation in Rangoon and Nay Pyi Daw, and ignores what’s going on in ethnic areas. We want our ethnic people’s voice to be heard”. The KnRC is a grassroots organization that provides support to Karenni and other ethnic minority refugees from Burma currently residing in two camps in Thailand. Ms Sally Thompson, the executive director of The Border Consortium said that it was important that funders stay committed to the refugees and displaced people along the Thai Burma border. The TBC provides food, shelter, camp management and livelihoods support for 110,000 refugees in Thailand and 120,000 Internally Displaced Persons (IDPs) in Burma.